​ Do you sing in the shower, in the car, or belt one out when your favorite song comes on? Are you interested in leaning how to sing or you just want to improve you skill set? Call us today @ (310) 832-0519 and sign up. The Gray School of Music has been giving voice instruction to people of all ages and skill sets in the San Pedro and Rancho Palos Verdes area for decades. 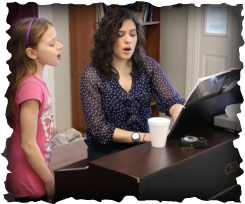 Want to know who teaches voice lessons at the Gray School of Music? All you need to do is click here. The truth is singing is natural but like any thing in life ... if you want to be good at it you need to practice and it is easier to learn with a good coach. The truth is this long standing myth that has been passed down for generations. Can you imagine if Harry Connick Jr.'s or Pavarotti's and the Three Tenor's parents felt the same way. How would your holidays go with out hearing Franks Sinatra sing you favorite tune? ​Interested in learning to sing or improve you skill set? Call us today @ (310) 832-0519 or use the form fill located on the Sign Up Today ​Page and schedule a lesson. The Gray School of Music has been teaching students how to sing in the San Pedro and Rancho Palos Verdes area for decades. We have been a family owned and operated business since 1950.